Leander Games’ new slot, Dragon Slot Jackpot, sets expectations sky high right from the title screen. Leander have partnered with noted artist Ciruelo to bring you this eye-popping slot. While we all know graphics don’t make a quality slot, with Dragon Slot Jackpot we may make an exception. The massive dragons featured in the title screen also appear as the high value reel icons and in the stunning bonus games where you will see dragons fight dragons and knights fight dragons. The action takes place in a beautifully detailed reel grid with a 5×3 layout. The detailed graphics really gives you the sense that you are playing on a premium slot title. While there is a 125 000 in game jackpot and wagers can be pushed up to 100 per spin, this game’s real rewards come from the Progressive Jackpot feature included. There are 3 jackpots to potentially unlock and best of all you won’t have to keep playing at max bet to stand a chance to grab your slice of the riches. Players gain entry into the progressive jackpot feature completely at random. These three progressive jackpots play a large role in pushing this slot’s RTP up to 95.59%. While the reel icons do feature plain playing card symbols, the main draw is the various dragons that feature here. These dragon symbols can pay out up to 2500 to players. The giant yellow dragon is the in game wild icon. 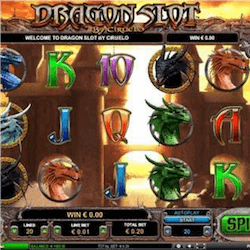 The dragon scatter symbol grants players access to the bonus feature in Dragon Slot Jackpot. There are two bonus games available for Dragon Slot Jackpot players. The first is the Dragon fight bonus game, which sees a white and a red dragon duke it out. The second is the Free Spins feature, which sees a brave knight go up against one of the dragons. The free spins feature not only awards 10 free spins, but also a variety of multipliers, depending on how the knight fares in his battle with a deadly dragon. Leander knows how to deliver a good slot game but Dragon Slot Jackpot shows the developer at their absolute best. The combination of graphics, features and progressive jackpots easily make this slot a must play for 2018. We may well see Dragon jackpot Slot at next year’s Global Gaming Awards as a game of the year candidate.